Gouriqua Apartment 101 - Mossel Bay Accommodation. 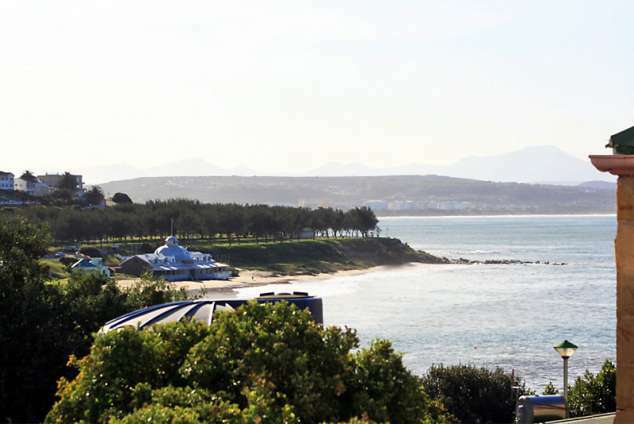 The four star Gouriqua Apartment 101 is situated in the CBD of Mossel Bay within walking distance to the beach. Step out of the building, cross the road and walk through the historical granary museum and you are a hundred metres away from our very own Blue Flag Santos beach. Guests are issued with a special ticket at no extra cost to allow them this privilege. The Post Tree as well as the Diaz Museum with the Caravel are on our doorstep. Guests can park their cars in a safe undercover lock-up parking garage and take the elevator to their apartment. A shopping complex with a supermarket, coffee shop etc. is around the corner with two other restaurants just as near. 101 Is a ground floor unit with three bedrooms / two bathrooms to accommodate seven (six private) guests. Two bedrooms have sliding doors that open up onto private verandas. Another bedroom faces south and has no sea-view. The spacious living room with dining area is stylishly furnished in leather and colourful Kilims and has sliding doors that open up on a balcony with a built-in barbeque. The kitchen is fully equipped with stove, microwave, icemaker fridge/ freezer, dishwasher and washing machine/dryer. We also have a plasma TV with full DSTV and a DVD player. Gouriqua is ideal for young and old and everybody who wants a safe, carefree, upmarket environment. We have special deals for longer stays. Apart from the historical area and the ocean, Mossel Bay is also home of two of South Africa's top 30 golf courses. Games can be arranged. If a little adrenaline is required, shark cage diving, bungee jumping, fishing trips and nature hikes or bike rides are also offered. 16052 page views since 31 Mar, 2010.